NEW DELHI: JK Cement, India’s premier cement company, today launched JK Cement ShieldMaxX, a white cement based universal waterproof putty, across UP, Bihar, MP, Jharkhand, Chhattisgarh and West Bengal. Developed using advanced German technology JK Cement ShieldMaxX protects walls from dampness, and efflorescence, resulting in longer paint life. This innovative product, contains Active SiH4 Molecules and is suitable for application on both interiors and exteriors/walls, making it a uniquely differentiated product proposition. JK Cement ShieldMaxX was launched at a gala event hosted in Delhi on Tuesday in the presence of JK White Cement’s channel partners from UP, Bihar, MP, Jharkhand, Chhattisgarh and West Bengal. 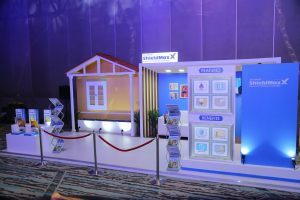 A key highlight at the event was the special experience zone with a living room and exteriors of a house, created to depict the application of the product. Besides dignitaries from JK Cement, renowned entertainer Sunil Grover was also present at the launch. While JK Cement ShieldMaxX will be piloted in the above mentioned states, the product will be rolled out across the Country soon. Idea for both new painting and repainting, the product is versatile and promises a velvet like finish on the walls along with higher coverage. It is perfectly suitable for bricks, solid or hollow blocks, AAC Blocks, concrete surface, plaster board on RCC/MIVAN/POP or similar surfaces. The product will be available in two different pack sizes i.e. 5kg and 20 kg and comes with a shelf life of 12 months. JK Cement ShieldMaxX will be distributed through a pan India network of dealers and retailers of JK White Cement. JK White Cement, has been a prominent player in the White cement industry over the last three decades and is a division of JK Cement Ltd., a leading cement manufacturer in the country. At present, the Company is one of the largest producers of white cement and wall putty in the Country and the 3rd largest white cement manufacturer in the world. In the past, JK White Cement launched JK PrimaxX, a revolutionary product, in response to the ever-increasing need for a white cement based primer.